Your guide will meet you and provide 4WD transport from your lodge or accommodation to the start of the hike – helicopter return or reverse order, depending on your return or reverse order, depending on your chosen hike. This Greenstone Lake nestled on the side of Mt Pihanga at the Southern end of Lake Taupo is a special place for tree lovers and bird watchers. It was formed by a giant landslide 10,000 years ago and the walk around the lake through stunning Podocarp and Native Beech forest bush makes for a very enjoyable outing. Approximately a 2 hour hike. Return to Taupo by helicopter, enjoy a scenic flight of approximately 45 minutes via the shores of lake Taupo. Allow 4 hours. Enjoy a 45 minute scenic helicopter transfer, via Lake Taupo and the World Heritage Tongariro National Park, to the alpine Waipakihi Hut. 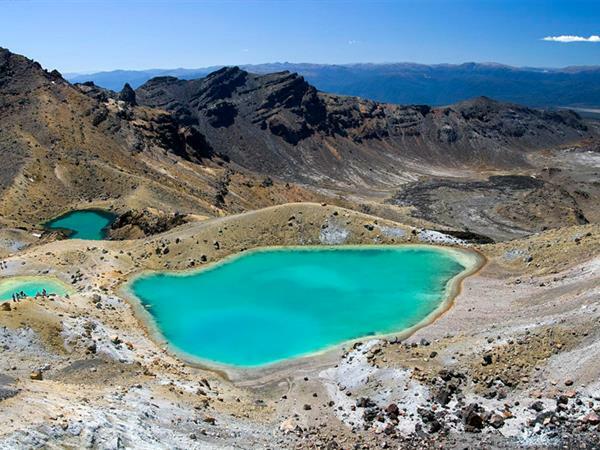 This is approximately a 5 hour guided high country bush walk over the alpine ridgeline of the Kaimanawa Forest Park, revealing expansive views of the Tongariro National Park and Lake Taupo, descending to the Tongariro River where you will be transferred by road along the eastern shores of the lake back to Taupo. Allow 8 hours. A 45 minute helicopter scenic flight via the shores of Lake Taupo to the Native Bush clad Waihaha Hut to commence your guided walk. This is a good walk following the Waihaha River on the western side of Lake Taupo, through a picturesque gorge and Beech trees ascending a ridge and then down to the river. The walk tracks through a Podocarp hardwood forest and on to the Western Bays access road,where clients will be transferred by vehicle back to Taupo. (Allow at least 6 hours) This flight can be taken in reverse order. Price includes: Helicopter, 4WD Transport, Guide and Picnic Lunch.